Whether you run your own business or need inflation equipment for events, then safety is always of the utmost importance. Here at Up Up & Away we take this very seriously, which is why we stock inflator safety equipment to ensure the risks are always minimised. Our cylinder safety wall brackets, for example, ensure air or helium cylinders are kept off the ground and safely attached to the wall. 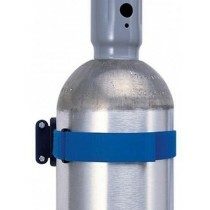 This minimises any risks of dangerous damage to cylinders – making your work as safe as possible. For more details or advice about our safety equipment, simply get in touch.